Tank heating systems, low shear pumps and air knife systems are some of the professional equipment supplied by Hurll Nu-Way to Australian craft breweries to taste commercial success. Several factors have contributed to the success of the fast growing craft brewery segment in Australia including the use of quality compounds and knowledge of brewers to clever marketing efforts promoting artisan beers. A very important component of this success is the choice of brewing equipment used in the production process. For example, the boiling of wort is essential in beer making, where the brewer needs to maintain the right ‘rolling boil’ brewing temperature to achieve the desired evaporation. When choosing the brewery vessel heating system, the beer makers use steam or high pressure hot water generated by boilers, electric heaters or gas heaters with immersion tube heat exchanger. While bigger plants can invest in boilers, mini breweries choose electric or gas fired heating systems. For vessel sizes of 600 to 10000 litres, which require heat input of 15 kW to 700 kW, an immersion tube heat exchanger fired by the gas burner is the most efficient solution. 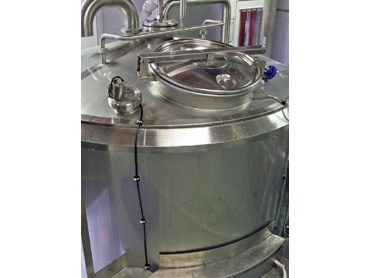 Key advantages of the Lanemark tank heating systems, available in Australia through Hurll Nu-Way, include helical coil immersion tube diameters of 3.8-15cm to fit into both cylindrical and rectangular brewing vessels with minimum intrusion into the brewing volume for overall operating efficiency; coil immersion tube heat exchanger connected to the externally mounted gas burner, running on gas or LPG; burner system raising vessel temperature from 60°C to 100°C in just one hour; and modulating control system allowing the brewer to maintain optimum brewing temperature and manufacture beer of desired qualities. Providing over 80% efficiency and reducing heating costs, the Lanemark tank heating system has been benefiting microbreweries in England for over 25 years, and is now available to Australian artisan brewers through Hurll Nu-Way. The gentle transfer of beer is another sensitive issue in craft beer making, protecting yeast, proteins and malts from shearing, and allowing a steady feed of beer into the centrifuge, minimising pulsations. Low pulsations are crucial to ensure efficient operation of the centrifuge. American craft brewers use eccentric disc pumps from Mouvex for the purpose. A low shear, low pulsation pump, available in Australia via Hurll Nu-Way, the Mouvex offers strong suction, which allows complete product extraction from the tanks and increases beer yield. The seal-less design of Mouvex pump prevents beer from oxidising as no air enters the system, while also considerably lowering maintenance and downtime. The same pump can also be used for cleaning in place the sediments in the tank. Labelling done during the final stages of beer manufacturing requires dry bottles, with low energy consumption also a major factor. A Secomak blower powered air knife system, available through Hurll Nu-Way is recommended for this application with up to 85% of running costs saved over conventional compressed air knives. Secomak air knives are easy to install and require minimum maintenance, further contributing to the craft brewery’s success.